Forthcoming astrology will help take some of the pressure off and entice you to feel a little more secure in your position. That you have set things up so well is the result of careful planning, conscious choices, and, as you’re now experiencing, continuous review. But don’t get too carried away going over the past. 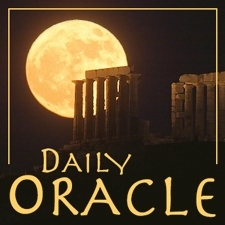 Today’s Oracle takes us to the Libra weekly for Dec. 19, 2003. Forthcoming astrology will help take some of the pressure off and entice you to feel a little more secure in your position. That you have set things up so well is the result of careful planning, conscious choices, and, as you’re now experiencing, continuous review. But don’t get too carried away going over the past. It is what it is, and the more obvious lessons are the more important ones, anyway. This is actually one of the more stable times in your life, and you can accomplish whatever you put your mind to. Have confidence in that. You really have whatever it takes.